Summary: There is real peril here, and a hilarious fight scene, and a happy ending, and everything in between. Pixar have raised the bar. Again. We open on sepia newsreel footage of explorer Charles Muntz (Plummer) and his dirigle, Spirit of Adventure, returning from the wilds of South America bringing a new discovery home. Muntz is greeted as a hero, but then accused of fraud; he and his dogs return to South America, vowing not to come back without the proof he needs to restore his reputation. A little boy watches, heart-broken at the treatment of his hero, but filled with inspiration. One day, he too will travel to the wilderness and find Paradise Falls! Seventy years later. Carl Frederickson (Asner) never made it to South America, but he had a full life with his best friend and soul-mate Ellie (Elie Docter). But now Ellie is gone, and Carl is alone; worst still, their home is the only thing standing in the way of a massive new property development. Carl doesn’t want to sell his house, but when he accidently injures a construction worker and the court orders him to a retirement home, Carl takes matters into his own hands, and with the help of hundreds of helium balloons, he flies away. 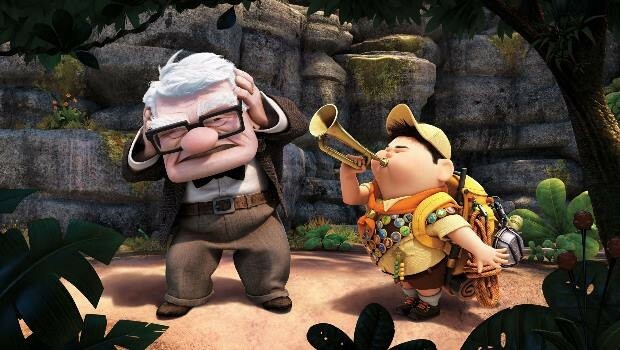 But like all the best ship’s captains, Carl has a stowaway… eight-year-old wilderness explorer Russell, who lacks only his ‘assisting the elderly’ badge in order to be promoted. Carl does his best to get Russell home, but the house gets caught in a violent storm, and when the sky clears they realise they are only a few miles from Paradise Falls. The balloons, sadly, lack enough lift to get the house across the canyon separating them from the falls, so Carl decides they must walk. Together they embark on the greatest adventure of their lives, where they will encounter talking dogs, an evil villain, and an unusual bird called Kevin. I loved, loved, loved Up. I cannot praise it enough. It’s tender and funny and moving and delightful and true and magical; it sweeps you up (see what I did there?) into its invented world and carries you off on your own adventure. Despite the 3D whizz-bangery, it’s a very old-fashioned film in many ways, harking back to Conan Doyle’s Lost World and Rider Haggard’s She. Paradise Falls (based on Angel Falls in Venezuela) is so remote that no-one lives there, not even tribal people. Yet, as with Wall.E, Pixar are not afraid to explore themes not usually found in children’s films: Carl and Ellie age before our eyes in a beautifully crafted montage that tells you everything you need to know about their love for each other. Ellie’s death leaves Carl bereft, and he turns into the classic, broom-shaking curmudgeonly recluse, talking to Ellie and keeping his house as a shrine. The film somehow manages an incredibly delicate balancing act; one foot in the real world of hopes dashed and dreams unfulfilled (the savings fund that always ends up paying for some boring domestic emergency instead of the dream trip) and the other in an Indiana Jones world of high adventure and wonder. But even in the world of wonder, where dogs can talk, kids still need to go to the bathroom. Russell is a perfect match for Carl – he needs a father figure, but is not self-pitying or drippy about it. He cleverly realises how to get around Carl, without being an annoying know-all. He’s also Asian, though this is never remarked upon. The detail and inventiveness are as loving as ever; everything we have come to expect. I loved Alpha, the vicious Doberman with the broken voice; he sounds more like one of the Chipmunks. Dogs, even talking ones, are still dogs – unable to resist a hotdog or a squirrel. There is real peril here, and a hilarious fight scene, and a happy ending, and everything in between. Pixar have raised the bar. Again. Note: the film was projected in 3D, which is completely integrated into the storytelling, and enhanced the depth and detail wonderfully; the vertiginous sequences at the climax will have you hanging onto your seat for dear life.